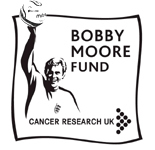 The Grambler is proud to support the Bobby Moore Fund for Bowel Cancer Research. This is a cause which is very close to my heart (and bowels). At the end of each season, all winnings shall be totalled up and donated to the charity in order to defeat bowel cancer, preferably in an epic battle involving Ewoks. The Bobby Moore Fund is of course named for former West Ham and England captain Bobby Moore, who died from bowel cancer at the far-too-young age of 51. The fantastic research carried by the Fund has helped to save many lives and long may it continue to do so. And is not all about raising money... I am particularly keen on spreading awareness of this terrible disease amongst young adults as I myself was diagnosed at only 26. Cancer Research provide great information about symptoms of this particular cancer, but it is all too often dismissed by younger men. Encouraging more people to spare a few minutes and read over the information could save lives. If you have taken any enjoyment from this blog, I urge you to wander on over to the BMF's website and have a look at some of the wonderful work that they do and the information that they provide. Even better, if you have a spare fiver, tenner or £127,342 in your pocket, please donate it to them via https://www.justgiving.com/Geraldine-Smith3 rather than squandering it on that Batman costume for your dog that I know you have been eyeing up.